I’ve encountered many artists over the years who really struggle with stepping into thriving because they don’t understand one foundational concept: convergence. Thriving isn’t simply doing one or two things well, but rather doing the right things well at the same time, over time. Although that might seem like a juggling act – and it can feel that way some times – it’s not as out of reach as you think. Here’s what typically happens with artists. They get two out of the three areas but forgetting that third, continue to struggle. For example, artists who are great artistically and have a strong spiritual connection end up having only a hobby or ministry because they don’t pursue the development of their art business. Artists who are great artistically and have a strong business sense often flourish in the marketplace with their sales but sometimes lack a deep spiritual connection and sense of life in their art practice. Then there’s artists who are deeply connected spiritually and have built a business but their artwork is lacking, leading to immature work and frustration. 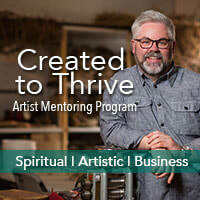 For artists who want to pursue their art in the marketplace in the context of their relationship with God, thriving happens when they are growing artistically, spiritually and in their businesses. Each feeds the other and provides momentum for the journey. This place of convergence is what I call your “sweet spot” and it should be a goal for every artist who wants to thrive spiritually, artistically and financially. What if Your Art is Just for Your Refrigerator? "How do you tell someone who is mediocre and not really called (or ready) to make his living with his art (simply because it will never sell) that perhaps God gave you the passion for art just to enjoy and glorify Him with, but it is not your calling to make it your financial sustenance?" It's a great question and I'm sure the reason no one talks much about it is because it can be a really sensitive issue for the artist... No one wants to have that hard conversation with an artist who's thinking they are ready to take on the world when in reality, they are still stumbling around with the basics. And then sometimes, there are those really hard cases that almost seem like the American Idol auditions where someone thinks they are God's gift to art when in reality, there's not much there but desire and belief. As I've thought about it, I hope these ideas will help you navigate your own artistic calling and season in that journey. No artist in the world ever started out as a pro. Everyone starts creating art because of a passion to create, to respond, to reflect what's going on in their own heart with the tools and techniques of their chosen creative medium. And unless you continue to cultivate that deep connection and love for creating over time, you'll become a burned out replicator of yesterday's inspiration. Creating as a hobby is valid, important and a worthy pursuit artistically, personally and as an act of spiritual devotion with the Lord. Most people start creating art because they love it. They find the process and the product to be enjoyable, fulfilling and that my friend is enough in itself! You could create for a lifetime in the context of your own personal enjoyment and be completely happy in your artistic pursuits. And in fact, if at any point you're creating and not enjoying it, you should stop, take a deep breath and ask some hard questions about where things took a wrong turn. Enjoying the process is core to why we all create. The first way humanity is introduced to God in the Bible is as artist. Then, the story progresses to reveal an artist-father who creates His man and woman, inviting them into the creative process with Him. We are His image bearers in the earth and we reflect the nature of our Creative God when we participate in the art making process. That alone is enough justification to create a whole life long because God is most glorified when we fulfill the design He formed in us. Your creative process is valid, important and worthy because it's a gift from God and a way to connect with and reflect His nature. If you never sell a piece of your work, it doesn't mean that somehow your creativity was less. It simply means you chose not to take it in that direction. For many artists who sell their work, including me, it's a wonderful encouragement that others love what I do but it doesn't define me or my enjoyment of the process. I created for many years before I ever sold any of my work and if all the sales stopped tomorrow, you would still find me out in the woods doing what I love... creating. I have never been more fulfilled in my life than since 2009 when I started creating and selling my artwork for a living but believe me, I work hard... really hard. Before that, I made my living as a worship leader and even owned a marketing company in Atlanta for several years. Trust me when I say I know a little something about making a living as a creative. However, when you move from hobbyist - someone who's doing your art for fun - to someone who's creating as a way to make your living, it's a completely different ballgame. You now have to work both on your art and in your business because you're an entrepreneur and an artist. Unless you're ready to embrace both sides of that equation, empowered by the Holy Spirit, you're in for a rude awakening. You can learn to do both and when you're called to it, there's grace for both but realize it takes grit, faith and focus to succeed. If you are intentionally growing in maturity artistically, spiritually and in business, wanting to sell your work on a larger stage then you have to keep your eyes out for signposts of favor. I've just learned over the years, when it's God's time for you to be promoted in the marketplace, no devil in hell can stop you. And at the same time, when it's not your time yet, nothing you can do will open any door that God still has closed. Recognizing the season you're in and following the favor in your life is key for every artist. When the time is right, the relationships, resources and connections you need to succeed will be there. Until then, be faithful with what's in your hand. Bloom where you're planted. Be faithful with little and God will make you ruler over much. If there's a life message in my, it's about helping others to agree with who God's called them to be, not to be bound by fear but stand in strength. That's foundational for all believers because no fear-laden, shame-filled artist is ever going to thrive as God intended. However, it's VITAL that you have a clear view of where you are in the journey, especially from an artistic perspective. Just because your work isn't good enough to sell or be really marketable right now doesn't mean you're no good, God doesn't love you or that the world is over. It just means you either have a wonderful opportunity to continue enjoying your work as a hobby OR you have a lot of work to do in order to mature your work to a place where it's salable. That's just the bottom line. Please don't think, however that just because you love creating and even feel called to create professionally that you're immediately ready to do so in a full-time capacity. If you're serious about really knowing where you are in this process, pray for God to bring someone in your life who will shoot straight with you. And when He does, listen. Anytime you're moving with the Lord, you should be feeling forward momentum. You should know you're on the right track, moving in the right direction. If you don't, I'd encourage you to stop and say "Ok, what's going on Father? Have I made a wrong turn, made some wrong assumptions or am I pursuing a direction that's not you?" This is so important. Where God leads and guides, there is favor and grace, authority and opportunity. If you're not feeling any of those things, it's important to take time to get clear before going any further. If you don't, you'll end up birthing something you have to sustain in your own strength. None of us finish where we start. Life is a process and be assured, your artistic journey is as well! If you believe God's plan for your life is to eventually be creating your art and selling it then that's awesome! Don't ever give up on that dream. Just be realistic about where you are in that process, what needs to happen next and who's going to help you get there. I'm passionate about that process and if that's you, I'd encourage you to check out my Created to Thrive Artist Mentoring Program. It's for any artist in any medium and in any stage of their artistic journey. Please comment below and let me know your thoughts! Also, for more on this topic, check out my article: Considering Art as Spiritual Experience, Hobby & Vocation. When it comes to art marketing, there can be a lot of confusion about what works, what doesn't and where to start. Whether you're a seasoned, experienced artist who's been creating for many years or a hobbyist just trying to take it to the next level, knowing how to sell your art is of primo importance! Art Marketing is about the "Special Factor"
I've had the privilege of creating sculpture both part-time and full-time for almost 25 years. After moving to Asheville, North Carolina in 2009, I opened a studio in the River Arts District and began selling my work full-time. Like a lot of artists, I did the typical things like running around to craft shows, selling wholesale to shops and "hoping" for customers. For me - and remember, everyone's different - that kind of selling drove me crazy! Shows were fickle, my work didn't sell great in stores or galleries because I wasn't there to talk about it and the hope strategy... well, let's just say that doesn't work. Hope is not a viable strategy for how to sell your art. Thankfully, because of my background in marketing and the fact that I am a people person, I recognized early on in my full-time art career that people pay top dollar for 2 things: special and connection. What does that mean, you ask? ​First of all, people are willing to pay a premium for things they feel are out of the ordinary, unique or special, especially if they align with their values. Now keep in mind, we're not talking about your average Wal-mart shopper here. I'm talking about people who are genuinely interested in your art and have the means to pay for it. When your work and your reputation is seen as something to be noticed, something to be valued, not ordinary or run-of-the-mill, all of a sudden, people start to take notice. That's what happened to me. I create sculpture primarily for luxury mountain homes and I love it. One of the things I did to help leverage the "special factor" of my work was to make a decision to install all my own work (when possible) and ask if I could take pictures once installed. Consequently, I have tons of gorgeous images of my work in multi-million dollar homes. Now, when prospective buyers are considering my work, they immediately see "Wow, this guy's work is special... look at who's buying his work." It lets my customers know that I'm someone to be collected and considered worthy of a significant investment. The other huge concept I employ in my business naturally, because I enjoy building relationships with people, is connection. I've found over the years that people who are making a significant investment in a piece of art want more than just a commoditized retail experience. They want a relationship. By and large, whether it's buying my work or the work of friends of mine who are painters, sculptors, ceramicists, jewelers or whatever, clients who are serious about purchasing hand-made, original art really enjoy building relationships with the artists from whom they purchase. It's fun for them and for us to get to know them, what they like, what they like about our work and deepen that relationship over time through multiple purchases and referrals to their friends. I have a studio here in Asheville's River Arts District which is open 6 days a week to the public. Nothing gives me more pleasure than to hear one of my clients coming through the door with a friend or out of town visitor saying something like "Oh, this is the guy I was telling you about..." All of a sudden, they've become my marketing department and a genuine friend. This same kind of connection is very important even if you're selling through strategic partners like interior designers or gallery / shop owners. Take time to go visit them, learn what sells in their stores, understand their clientele and then work to make them look great! I have a friend up who has a beautiful furniture store in a very wealthy area and she has a trunk show for me every couple of years. That one relationships has produced more than any other relationship in my art career simply because every time I go to that area, I stop by and say hello. I send flowers after a referral. I treat her customers very well. Yes, you guessed it: I'm building connection. Take some time to understand what makes you uniquely you and what makes your art unique as well. Dig around into the story of what makes you tick and why you create. The more you develop and share that story, the more people will have the opportunity to connect with the real you. Start asking questions from people who buy your work. What did they like? Why did they purchase? What did they connect with about you or your work? As you start to understand where the connection is, you can then begin to deepen that connection through doing more of the same. I always say, work on what's working. Tell the story of your special factor and authentic connection throughout all of your marketing materials. Remember, art marketing is not about selling your stuff, it's about building relationships with people. Your marketing should be completely focused on building connection with people around what you know they love about what you create. Do that and your business will thrive. Listen, marketing your art and yourself is much more than simply learning how to sell your art. It's about creating an image that reflects your uniqueness in the niche you're targeting and then working to build authentic connections within that niche of clients, partners and prospects. Learn to do that well and you'll never struggle to sell your artwork. If you don't, you'll be reduced to doing what everyone else does, shlepping around your stuff to every art or craft show that will let you in, wondering who's going to buy your widget this time. You can thrive if you'll focus on the special factor and on building connection. My absolute favorite marketing video that exemplifies this way of selling is below called "A Tour Guide to the Two Plants: NEO & Traditional." Do yourself a favor and watch it. Then comment below to let me know your thoughts. Also, for more strategies on how to sell your art, check out my artist mentorship program called "Created to Thrive". Tons of teaching videos, activities and a private Facebook community as well as live q/a sessions with me to help you thrive as an artist. I hope you're full of faith and expectation for an incredible 2018! To help you along that journey, I wanted to share a simple tool that I use in my Created to Thrive mentoring program called "What's Working, What's Not & What's Next". It's a simple 5-page PDF that will help you evaluate where you are and where you want to go this year. Consider this my new year's gift to you! I'm praying this year will be your best year ever! Just download it here and then let me know how you're using it by commenting below.